I have worked with Krimson Klover twice in the past now. This is my 3rd time working with them. And I have never been disappointed. I received a sweater when I was pregnant with Emerson, it fit me then and it still fits me now. Then last summer I received a tank top that I ADORE! And this time around I received yet another sweater for my review. I got the Daisy Chain in Ruby and I love it so much! I got the Ruby (red) and it's the perfect fall/winter color for me. I don't wear a lot of red so it's nice to have something different. The other colors are Charcoal, Coriander, and Ink. I received the size medium and it fits me with a bit of room as well. Their sizing is pretty dead on. I typically wear a small and this would have fit me in a small just perfectly. The Medium is certainly wearable, but it's a tad big. This is a wool item so it's Hand Wash or Dry Clean only. Which is fine with me. Since it's a sweater it only needs to be washed probably 2 times per winter season, so that's not bad. They have many other items to choose from like tights, dresses, skirts and accessories like scarves, socks and hats! Price: This sweater is $208. BUT it's 100% Merino wool so it's super soft and comfortable and will last years and years to come. Overall: ***** love Krimson Klover! I also like the Midnight Train sweater. I love the Ikat love skirt. I also love the step by step dress. The summer breeze top is adorable! I love their Tula skirt in charcoal! I like Krimson Klover's Penelope sweater. I like the Texas Two Step. I like the Sugar and Spice sweater. i love the nelly skirt! I love the finest hour dress! I like the Penelope sweater! Cool idea this would be nice for life here in Chicago. We are expecting a big snow storm tomorrow. I like the Atypical Situation. I love the Zamora drape neck pullover. I like the Mayflower sweater. Pretty. I love the little dipper top. I love the Curves Ahead Dress in black. The Cleopatra Dress is sickening! The pre-loaded Rafflecopter text is about the Conscious Box giveaway instead of the sweater giveaway. I like the Cleopatra dress! I love the Bird on a Wire Dress. I LOVE the Finest Hour Dress!! Id love the Greta sweater in Dusty Blue! I like the Step By Step dress! I love the Claudia Long skirt! 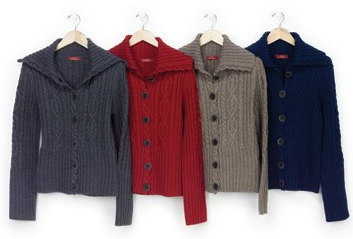 I love the Andora sweater! I like the Swan Lake Dress. I like the Tula skirt. The Ikat Love in ink/denim. Love the Andora sweater- so pretty! I like the Claudia Long skirt! The Penelope is really cute! I like the Sonja sweater! i love the belle ami sweater. i love the sonja sweater. I like the Seltic Bride sweaters. I love the Feather Thy Nest sweater. I love the Ikat love skirt! I really like the Step By Step cowl dress. I also like the Pony Express. I like the Zamora Sweater. Thank you! I would like the zamara sweater. I like the Kara scarf. I am in love with the Stories Untold jacket in the ink/denim combination. I like the Finest Hour Dress in black/charcoal. I love the Stories Untold sweater jacket. I also like the finest hour dress! I like the Ikat Love skirt. Definitely the Sweet As Honey Shawl. I love all the colors! the weekender sweater is adorable. It's the kind of sweater you wear sitting on your porch drinking coffee and watching the sun come up. I really like Midnight Train. I like the Striping Encounters. I like the Gabriella sweater! I also love Feather Thy Nest!